Go Berserk This Thor's Day With One of These Viking Chess Sets! Go Berserk This Thor’s Day with a Viking Chess Set! If you’ve ever dreamt of pillaging the coasts in search of a new settlement, these Viking Chess Sets are for you. Skål! Vikings have been making a comeback lately. Interest in Norse culture really took off after the TV show Vikings became popular, and it hasn’t stopped since. Of course, there were many people who became interested in the Viking way of life long before the TV show existed, and will continue to be interested long after it fades from the public eye. No matter which type of fan you are – whether old or new, you may be interested in a Viking themed chess set to combine your interest in Vikings with your interest in chess! What better combination could there be? If that’s what you’re interested in, you’re in luck. 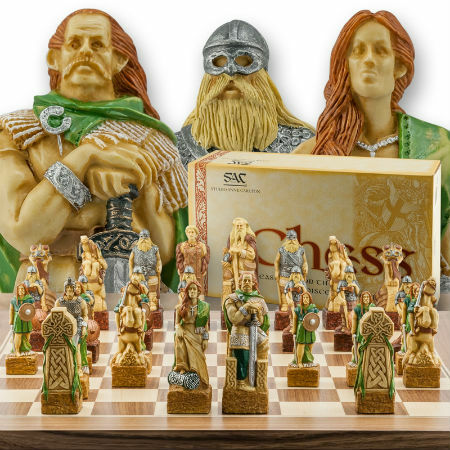 As it turns out, there are many Viking themed chess sets available online, and we’ve picked out the very best ones to review for you. By the time you get to the end of this article, you’ll have all the information you need to pick out the perfect Viking chess set! Of course, as any Viking fan knows, the ground beneath one’s shoes isn’t nearly as important as the person filling those shoes, so you may only need a nice set of Viking chess pieces rather than a full Viking chess set. They’ll look good on any chessboard! 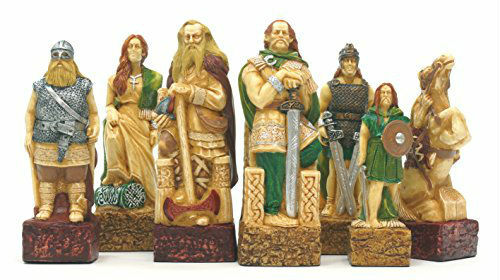 The Celtic Vs. Vikings Chess Pieces are a very unique and eye-catching set. Each piece is molded from Polyresin and then handpainted in stunning detail with vivid coloration. The Polyresin gives these pieces all the beauty and rich feel of stone, but with the durability and low maintenance of plastic, so it’s the best of both worlds! This set includes the Viking chess pieces only, but that’s just as well, since these amazing pieces will certainly steal the show and distract attention from any chess board they’re placed on. You may be wondering about the history of conflict between the Vikings and the Celtic people which inspired The Celtic Vs. Vikings Chess Pieces. In brief, the Celtic people were the original inhabitants of much of Western Europe- including Ireland, Wales, Brittany, and the Scottish Highlands. These lands were subjected to frequent raids and pillaging by the Viking invaders who came from the Norse lands over the water. They fought against each other for years and years, but this Viking chess set captures a particular battle that was fought at Clontarf, near Dublin. There, Viking invaders were met by the Celtic forces of the Irish King, Brian Boru. The Celts fought tooth and nail to drive off the Viking invaders who were bent on colonizing their lands. In this battle, the Celts managed to drive off the Vikings, though King Brian Boru was slain. Perhaps the most famous and authentic Viking chess set was the historical set found on the Isle of Lewis in 1831, when the ocean washed away a sandbank and revealed a small building housing the pieces that had been buried for many long years. Ancient even then, those pieces have come to be known as the Isle of Lewis chess pieces, and are one of the oldest examples of chess pieces we have still intact. 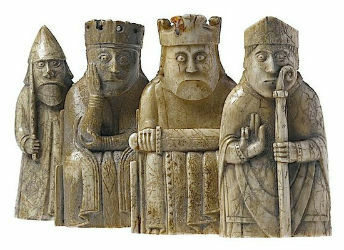 Because of their rarity and immense historical significance, the original Isle of Lewis chess pieces are kept safe and displayed at the British Museum. But that doesn’t mean you can’t have them in your home! The Isle of Lewis Chess Pieces – 3.5” King – METAL set is a high-quality reproduction of the historic Viking chess pieces that is very true to the original. Every detail is painstakingly researched and reproduced to make this set as close as possible to the real thing. There are many Isle of Lewis reproduction chess pieces out there, but we believe that these are the best. 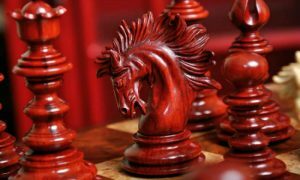 The luxurious metal material and painstaking attention to detail on each piece sets this particular Isle of Lewis chess set apart from all the rest. 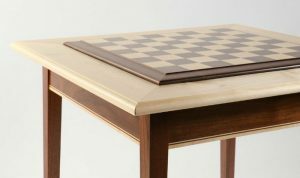 This piece of chess history is available at a surprisingly affordable price. 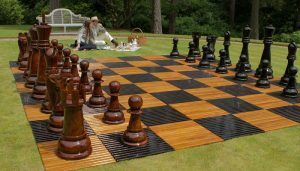 You can also choose to add a chess board and chess box to the deal at a discounted rate. 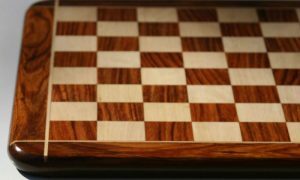 The chess pieces are available in a brown metal colorway or a creamy white one, whichever you prefer. Now you’ve read our review of the best Viking chess pieces available online, you’re ready to make your choice! At this point, you may make your decision based on any number of factors, such as style. 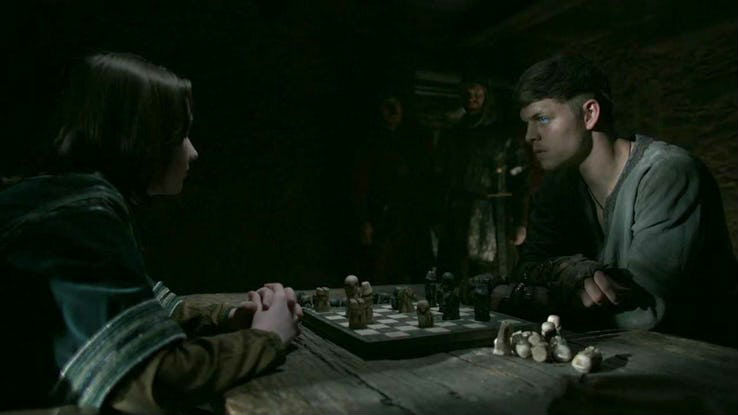 One set of chess pieces has a highly realistic and lifelike look while the other is more cartoonish, though it’s also more historically authentic to the kind of sets Vikings themselves were actually playing on. 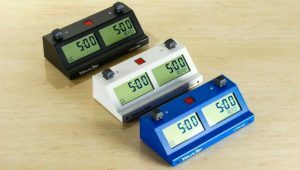 There are also the considerations of budget, preferred material, and size that may sway your decision as well. 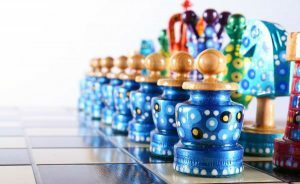 No matter which Viking chess set you end up choosing, you can’t go wrong with any of the ones on this list! We’ve talked a lot about Viking themed chess sets and historical Viking chess pieces, but there is actually another element of Viking chess that you may be interested in learning about. You see, like many other cultures across the world, the Vikings actually had their own chess variant that they played among themselves. It was known as Hnefatafl, and if you’re a fan of the TV show Vikings, you may have seen it being played! A Hnefatafl game between Ivar The Boneless and Alfred The Great (“Vikings”). Hnefatafl is known as one of the Tafl games, of which there were many among the Vikings. It is also known in the modern world as Viking Chess, which is much easier for English speakers to pronounce! We know that the game was played in medieval Scandinavia because it was mentioned in several of the Norse sagas which were written around that time. Unfortunately, the rules of the game as played at that time were never explicitly recorded, so historians have had to guess at most of them in order to recreate the game in a way that can be enjoyed now. 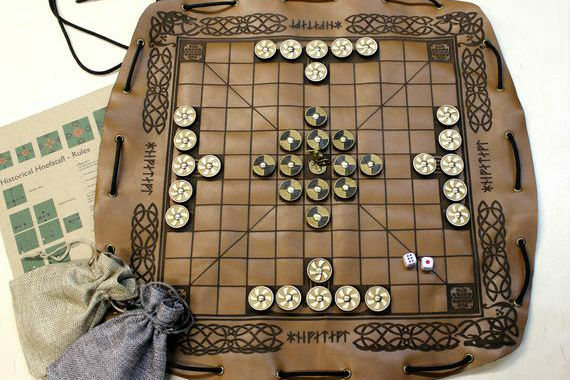 Hnefatafl, also known in the modern world as Viking Chess. Though the original rules of Hnefatafl have been lost to time, an attempt was made in the 1900s to reconstruct the rules based on the rules of similar games, including the ancient Roman game Hnefatafl is thought to have been originally based on. Unsurprisingly, this uncertainty surrounding the actual rules of play have led many different variants to crop up, and you can play Hnefatafl several different ways both in person and online. One version even involves rolling dice! As far as we can tell, the modern version of Viking Chess game involves the unfavorable odds that Vikings were known to relish in real battle. On one side of the board, a King and a small force of defenders try to hold their ground while faced with a force of attackers twice as numerous as the defenders. During the game, the defending King will attempt to escape, and his defenders will try to aid him in doing so while the attacking force attempt to capture the King by surrounding him on two opposite sides. We may never know exactly how the Vikings enjoyed the game of Hnefatafl, but we can still have a lot of fun trying to figure it out! Which Will You Choose – Viking Chess or Viking Chess Pieces? Viking fans have many options when it comes to combining their love of Vikings with their love of chess. 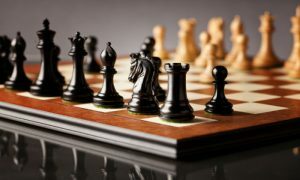 You could go as far as to learn to play the ancient game of Viking chess known as Hnefatafl, or you may be satisfied playing modern chess with a custom set of Viking chess pieces. Whatever you choose, enjoy your game!